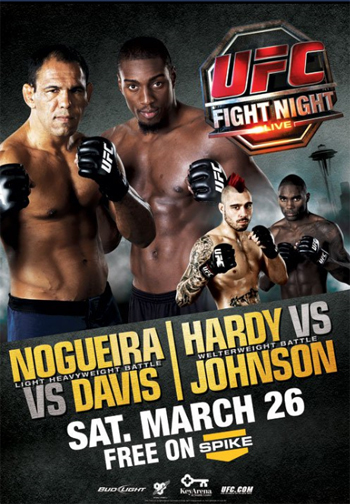 Fact: “UFC Fight Night 24: Nogueira vs. Davis” takes place this Saturday inside Key Arena in Seattle, Washington. Fact: Only fans with access to an east coast feed will be able to watch the bouts live. While fanatics across America were under the impression this weekend’s freebie fight card would broadcast live on Spike TV, the edgy network has just issued some bad news. The two-hour exhibition will air at 10PM ET/PT, which means the majority of the country will see the contests via tape-delay. While I would never boast about how great DirecTV is, the satellite giant has always provided Spike’s east coast feed. Therefore, DTV subscribers will be able to watch Saturday’s scraps live no matter where they live. Please check with your cable provider for times. A pivotal light heavyweight affair between Antonio Rogerio Nogueira and Phil Davis (AKA Jon Jones) will headline the show.